That same night there is the sound of gunfire in the streets. Amir and Hassan are frightened, but Ali embraces them and says it is just people hunting ducks. Later Amir would learn that the gunfire symbolized the end of the Afghan monarchy – Daoud Khan had overthrown his cousin King Zahir Shah (while the king was abroad) in a bloodless coup. Daoud Shah instituted a republic and became president. Amir says that that night was the end of the old Afghanistan, though no one knew it yet. Again the political intrudes on the private, and Amir makes it clear that the characters’ lives are about to change, though he doesn’t say how yet. Amir’s idyllic childhood is about to change, and not for the better. Zahir Shah’s reign lasted for forty years, and marked a time of peace for Afghanistan that has not been seen since. Amir and Hassan distract themselves from a political radio show by going off to climb a tree, but on the way a group of boys attacks Hassan with rocks – Assef, Kamal, and Wali. Assef is a feared bully who carries a set of brass knuckles and loves to be cruel. Amir says that later he would realize Assef is a sociopath. Assef is one of the ones who mocks Ali, and calls Hazaras derogatory names. Assef, the antagonist of the novel, first appears here. His arrival in the narrative is a sign of negative political change in the country as well, as Assef is bullying, violent, and hates Hazaras – like many of the Afghan governments to come. Assef gloats about the new government, and says that his father knows Daoud Khan, the new president. Assef says the next time Daoud Khan comes over for dinner Assef will tell him about Adolf Hitler, and how Hitler was a great leader with the right ideas about ethnic purity. Assef says Afghanistan is the land of the Pashtuns, and he wants to purify it of the “dirty” Hazaras. Assef, though he is only a boy, suddenly seems to have more power because his father knows the new president. This is a sign of future events, when the violent will be given power over the weak. In Assef, Hosseini controversially equates the racism of some Afghans to that of Nazis in Germany. Amir tries to defuse the situation but Assef takes out his brass knuckles and says that Amir is making things worse by being friends with Hassan. Amir cannot help but think that Hassan is his servant, not his friend, but he immediately feels guilty for the thought. Assef is about to hit Amir when Hassan suddenly grabs a rock and aims his slingshot at Assef’s face. Hassan politely asks Assef to leave them alone, or he will have to change his name to “One-Eyed Assef.” Assef is shocked but scared, and he vows to get his revenge someday. The three boys leave, with Kamal and Wali amazed that their leader was humiliated by a Hazara. Amir and Hassan return home, trembling. Hassan again proves himself as brave and unwaveringly loyal to Amir, while Amir cannot help his selfishness and racial prejudice against Hassan. Amir is relieved that Hassan saves him from a beating, but the older, narrator Amir knows that his younger self partly believed Assef, and thought that Hazaras were inferior. This slingshot scene will recur much later in the novel, and Assef’s vow of vengeance has powerful repercussions. For a few years after Daoud Khan’s coup, life seems to go back to normal, and there is hope of reform and economic growth. One winter (1974) Ali calls Hassan inside, saying that Baba wanted to speak with him. Amir describes how Baba got a present for Hassan’s birthday every year. With Baba is a plastic surgeon named Dr. Kumar, and Baba explains that he is his birthday present this year – Baba will pay for the surgery to fix Hassan’s cleft lip. Amir is jealous that Baba would do so much for Hassan. The surgery is a success, and by the next winter Hassan’s cleft lip is just a faint scar. Hassan’s cleft lip was a symbol of his contrast to Amir’s privilege – Ali does not have the money to fix his son’s deformity. The fact that Baba pays for the surgery will become important later, but also the fact that Hassan is briefly given the privileges of a Pashtun shows more upsetting of balances. Amir is again jealous of Hassan, and automatically bitter against him when he earns Baba’s approval or sympathy. Cosby, Matt. 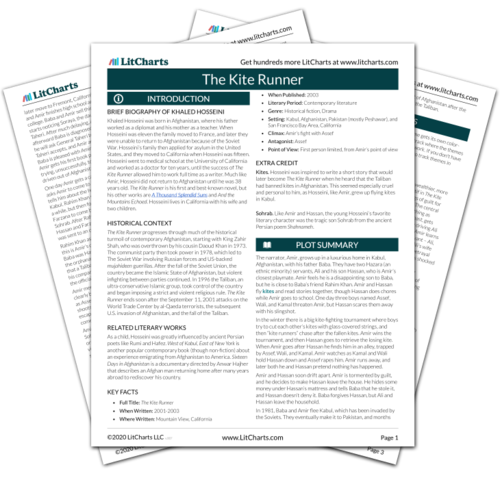 "The Kite Runner Chapter 5." LitCharts. LitCharts LLC, 9 Feb 2014. Web. 25 Apr 2019. Cosby, Matt. "The Kite Runner Chapter 5." LitCharts LLC, February 9, 2014. 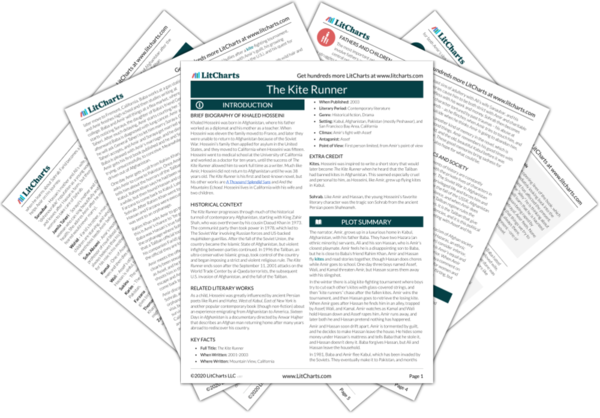 Retrieved April 25, 2019. https://www.litcharts.com/lit/the-kite-runner/chapter-5.